The Signal Hound BB60C Real-Time Spectrum Analyzer and RF Recorder is the newest addition to the Signal Hound family of products and the successor to the USB-BB60A. The BB60C streams 140 MB/sec of digitized RF to your PC utilizing USB 3.0, providing an instantaneous bandwidth of 27 MHz, and sweep speeds of 24 GHz/sec. The BB60C has significantly improved performance compared to the BB60A. The BB60C has improved spurious-free dynamic range (SFDR) by 20 dB, and flattened noise floor and band transitions by more than 8 dB. The BB60C also adds new functionality in the form of configurable I/Q streaming bandwidths which will be retroactively available on the BB60A. The BB60C Option 1 has an extended operating temperature range, from -40ºC to +65ºC. As a spectrum analyzer, the proprietary application programming interface (API) can perform up to 1.2 million FFTs every second, delivering real-time spectrum data to the open-source Graphical User Interface (GUI), or to your own software application. Because of these immense processing requirements, we recommend a desktop PC with an Intel quad-core i7-2600 or better, or a laptop with an i7-3612QM or better. The BB60C is ideal as a RF recorder. Variable I/Q sample rates allows fine grained control over how much spectrum should be recorded. Data rates range from 312.5k to 40M I/Q with configurable band pass filters. 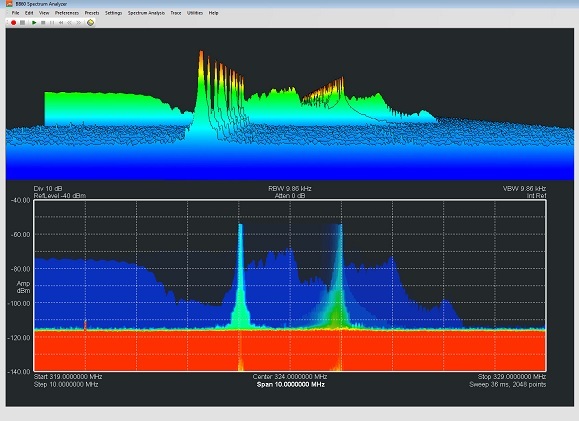 The open-source spectrum analyzer software features a 2-D waterfall or 3-D topographical view, as well as a GPU accelerated color persistence display. Normally undetectable events are easily seen in this mode. Turn on color persistence to see what you’ve been missing! The picture (top right) shows a real-time capture of an HP8662A stepping between two frequencies. You can see exactly what happens in the frequency domain as the PLLs unlock and lock during the transition, illustrating the power of the BB60C as a development tool. 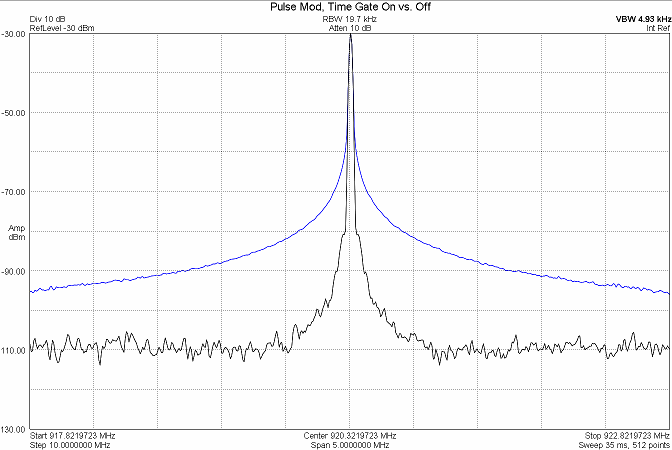 We also feature time-gated spectrum analysis, allowing you to specify a gatelength and a gate delay relative to a provided trigger. This allows you to see the spectrum at a specific time, for example to view the spectrum during the “on” time of a pulse-modulated signal. RF frequency range from 9 kHz to 6 GHz. Wide dynamic range from -158 dBm to +10 dBm. Resolution bandwidths available from 10 Hz to 10 MHz. Powered solely through USB, no external power supply needed. Powerful digital signal processing happens on the PC. Software and hardware included for one low price. Use the API (Application Programming Interface) to develop your own applications. Get started quickly by customizing the included open-source GUI. Digitized IF Data at 80 million samples per second. Compatible with Windows 7/8 64-bit operating systems. USB 3.0 communications providing 140 MB/sec sustained throughput to PC. Measures under 230mm (9") long. *The Signal Hound money back guarantee is valid for the first Signal Hound product purchased. When multiple units are purchased only the first of any model is covered by the no-questions guarantee. This guarantee does not limit a customer's rights under law. We use the free spam filter from MXGuarddog.